Parcel, also known as Leaf Celery, closely resembles celery, but is grown for its leaves rather than its stems. 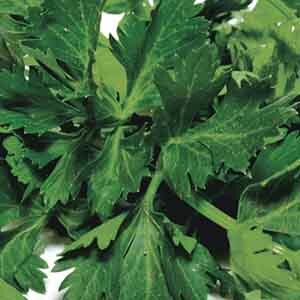 The leaves have a delicious celery flavor, and can be added fresh to soups, salads and meat dishes. Try adding freshly cut leaves to the dinner plate as a garnish. Parcel leaves add textural interest to mixed container plantings and beds. Excellent for flavoring a variety of dishes. Use fresh in soups, stews and vegetable dishes. Makes a lovely garnish. Wash fruits, vegetables and herbs thoroughly before eating. Best in slightly acidic, organic-rich soil. Do not allow soil to dry out. Pick the leaves frequently. If planting the herbs in a container, start with a good quality, commercial potting soil. These are usually lighter in weight than topsoil, sterile and pest-free. Many are available with a mild starter fertilizer in the mix. Prepare the container by filling with potting soil up to 2” (5cm) from the rim of the planter. Remove the plant from its pot or pack. Make a small hole in the soil slightly larger than the root ball either by hand or using a trowel. Insert the plant into the hole and press soil firmly around the roots and just covering the root ball. When all the plants are potted, water thoroughly to settle the soil and give plants a good start. Herbs planted in the garden don’t require additional fertilizer. Apply a 1-2” (3-5cm) layer of mulch or compost. As mulch breaks down it supplies nutrients to the plants and improves the overall soil condition at the same time.